They're off to a good start. Still, Habsland has this nagging feeling. The ominous shadow of last season hangs over this team. They were off to an even better start in 2006 when the wheels fell off. We can blame 2006-07 Maple Leafs MVP c difficile all we want, but deep down we all know they were doing it with smoke and mirrors. The $64,000 question is, Will the same thing happen this year? Let's pop the hood and look for some warning signs through the first 24 games. All stats in this post are from behindthenet. I'm only including the 4-on-4 info for the sake of completeness. It's irrelevant compared to 5-on-5. First off, the +32/-43 in 5-on-5 play looks like trouble. It's eerily reminiscent of last year. Good teams don't get outscored 4:3 at even strength. The shot differential is negative, but it's nowhere near this 4:3 ratio. They're only being outshot by 1.3 shots per game, 5-on-5. If you look a little closer, you'll find the Save percentages are the difference. The league average EV Sv% is .916 (calculated by adding up each team's Sv% and dividing by 30). As expected, Huet and Price are above average at .924. Montreal shooters have been making opposing goalies look like Tretiak. Collectively, they have had a .940 Sv% - the Habs have been shooting 6% at ES. Only the Rangers have been worse, at 5.4%. I can accept that Montreal shooters are below average, but this looks suspiciously like a run of bad puck luck. If Montreal could shoot a below-average 7.6% rather than an abysmal 6%, they would only be outscored 40:43 at ES. If they could shoot at a league-average 8.4%, they would be outscoring opposition 45-43. But let's not get carried away. Shooting 7.6% is a reasonable goal for a team comprised of four 4th lines. It's a different story on the PP - shooting percentages are abnormally high. League average Sv% are .870 for 5-on-4 and .750 for 5-on-3. As unlucky as the Habs have been at ES, they've been extremely lucky on the PP. We can be pretty sure that the Habs PP is good, this being it's second successful year in a row, so we'll grant them a 5-on-4 Opposition Sv% of .850. That's still a lot better than average, but you have to consider that had they not scored on some of those 'lucky' shots, the PP would have continued and they would have had more shots. Things look normal for the 4-on-5 penalty kill. League average Sv% is .870 - Price/Huet performing at .882 is reasonable. The 3-on-5 Sv% is way out of whack. They're giving up fewer goals per minute when down two men than when they're down one. Those numbers will change by the end of the season. A .760 Sv% is more reasonable for 3-on-5 situations. With some rounding, that means 4GA rather than 1. The other piece of puck luck on special teams is the 4 shorties scored and none allowed. Last season, the Habs scores 15 and allowed 5. There is probably some repeatability there, but not the 3:1 ratio. I'll use a completely arbitrary and unjustifiable 4:3 ratio as reasonable. This means the Habs are up another 3 goals here due to luck. On average, Montreal is on the PP for 7.6 minutes per game and spending only 6.8 minutes on the PK per game. The success of the PP means that the difference between penalties drawn/taken is even greater. This is a huge improvement over last season, and it's a bit of a wild card. I'm not optimistic that they'll be able to sustain this, but then again I'm wrong an awful lot. If the Habs conformed to the league average, they would have been on both the PP and PK for an equal 7.3 minutes per game. This would have resulted in a 2 goal swing downward - instead of scoring 4 more PPGs than their opposition, it would be down to a +2. However, I'm going to call this one a wash because they just might be able to continue drawing more penalties than they commit. They've scored 3 and allowed 4. As of Nov. 23, the publication date of this post at IOF, opponents hit seven more posts than did the Habs. I don't know what to make of this. There is some debate regarding the accuracy of the stats. No one calls shots that go off a post and into the net 'lucky' for the shooter, but shots that hit the post and stay out are somehow 'lucky' for the goalie. There must be some number of goalposts hit that would have been saves if the shot had been aimed an inch or two closer to the centre of the net. Intuitively, something tells me the luck value of a goalpost is not more than half a goal. I'll call the -7 goalpost differential equivalent to 3 goals worth of luck. I'll allocate two of those to 5-on-5 and one to 4-on-5. Total: Habs have been lucky by 4 goals. Instead of a +7 differential (69GF, 62GA) in these situations, we should have expected only +3 (73GF, 70GA). They may not be quite as good as their record indicates, but they're not a sub-.500 team either. As long as no major injuries strike, everyone gets their flu shot and there are no lengthy skids of bad luck, they should stay above .500 and make the playoffs. Update: It looks like I might have double counted a shorthanded empty net goal. It doesn't change the conclusion much - the good luck on the PP and 3-on-5 PK has been countered by rotten luck scoring at 5-on-5. The team should be able to maintain a slight positive goal differential. posted by Jeff J at 4:27 p.m. Shot quality, shot quality, shot quality. What if it's not about luck? What if the Sv% was a reflection of the team's inability to generate quality shots on ES and, conversely, their ability to generate quality shots on the PP? I think that's the crux of the matter. Yeah, Price made 43 saves last night, but how many on bounce backs? According to this paper by Ryder, the Canadiens road shot quality for (SQF) in 2006-07 was 3.4% above average. Road shot quality against (SQA) 1% below average. Ryder recommends using the road factors to eliminate local reporting bias. So, IF (that's a big if) these factors carry over to this year AND opposing goalies average out to league average, Habs shooters should not only close in on league average, but exceed it. We aren't given a PP/ES breakdown and I'm not about to go figuring it out. If you assume the PP shot% I used is right (it's reasonable to expect it to be above average), weight EV shot% by a factor of two (since EV shots:PP shots are roughly 2:1), an EV shot% of 8.0% would give us the 1.034 SQF. That compares favourably to the 7.6% I used and would mean a difference of two goals in my 5-on-5 luck adjustment, down to -10. 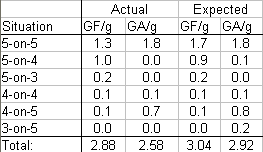 Conversely, I could also increase the expected shot% on the PP and remove two of the luck goals from there. Six of one... Net effect is two goals in the Habs favour. It's much harder to make adjustments to shots against because I'd have to divorce the goaltenders' save% from the shot quality. It's a hell of a lot easier just to say the save% I used for the Habs in all situations looks reasonable, and the shot quality against is built in. I do think shot quality is important, but using it in a post as high level as this just isn't worth it. The point of the post was to look for aspects of the Canadiens' performance that are unsustainable. For the degree of detail I'm providing, adding shot quality is a hell of a lot of work and would only chase relatively small effects (which I hope to have demonstrated in the half-assed handwaving explanation above). Oh, and if you get outshot 43-30 every night, shot quality means squat. Even if your SQF is better than your SQA for the game by 20% (which is substantial), that's still >40% more shots against. I follow you re: goalposts... some of them *would* be saves, right? Though I don't think that guessing 50% is anything more than minimizing the error in either direction. I think it was Tom Barrasso who responded to a question about a couple of "lucky" posts behind him with, "What, now I'm supposed to stop the misses too?" Ryder Criticism. Alan Ryder, that is.